Please click the title above to CLEI's recently published article on transepithelial (epi-on) corneal collagen crosslinking for keratoconus. The article analyzes the data from our epi-on crosslinking clinical trial. Epi-on crosslinking versus standard (epi-off) CXL: In the standard corneal collagen crosslinking procedure for keratoconus, the surface epithelial cells are first removed. The epithelial cells are similar to the tiles on a floor. We remove the cells in order to allow better penetration of the riboflavin drops into the cornea. This is followed by exposure to ultraviolet light which interacts with the riboflavin in the cornea to produce the crosslinking reaction occurs. After the procedure, the epithelial cells take 4-5 days to heal. Some people refer to this as an epi-off procedure. This technique is the only FDA-approved method of CXL in the U.S. today. In the transepithelial crosslinking procedure, or the epi-on technique, the treatment is similar; however, we do not remove the surface epithelial cells. Because those cells remain in place and don’t need to replicate and heal, there are a few potential advantages of the epi-on technique. First, leaving the cells in place may lead to faster visual recovery and earlier return to contact lenses. Also, since there is less disruption to the surface cells, the potential for infection and the potential for corneal haze may be somewhat less. There are some disadvantages also to the trans-epithelial technique. Most of these relate to its relative efficacy compared to the standard technique. 1) With the epithelium intact, it is more difficult to get complete riboflavin saturation into the cornea. Remember, the cornea absorbs riboflavin much like a sponge absorbs water. With the epithelium in place, riboflavin, a very large molecule, finds it more difficult to diffuse into the corneal tissue. There are methods to achieve good riboflavin saturation with the epithelium intact and new riboflavin formulations which are being studied, however. 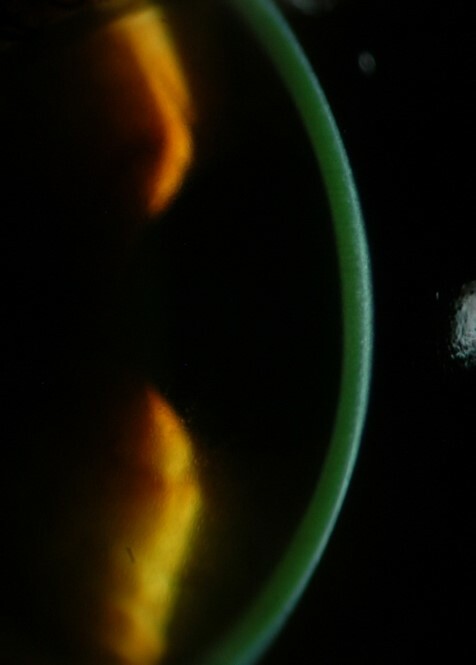 The picture below shows complete riboflavin saturation into the cornea of a patient with keratoconus. 2) The epithelium itself can act as a mask absorbing some of the incoming ultraviolet light. This may attenuate ultraviolet light energy deeper in the cornea and make the treatment effect more superficial and less deep and, thus, potentially less effective or longlasting. 3) Oxygen is required in order to perform a complete crosslinking reaction. With the epithelium intact, oxygen diffusion may be more difficult, and thus we may not get as much of a crosslinking effect as with other techniques. 4) Although there does appear to be less transient corneal haze formation with the epi-on technique, it’s not yet clear whether this haze is an unwanted side effect of crosslinking or really represents the crosslinking effect as can be seen when we look at the cornea with the microscope. Here at the CLEI Center for Keratoconus, we have been studying trans-epithelial crosslinking in a formal clinical trial. We have looked at 82 treatments thus far over the course of the year. Using the techniques of the study we are able to adequately achieve good riboflavin saturation into the cornea. As in the standard crosslinking technique, we see a generalized improvement of the height of the keratoconic cone one year after epi-on crosslinking. It can’t be directly compared to the result that we have with standard crosslinking techniques because of study designs, but it does appear that, although effective, the results may be less robust using the epi-on approach. Remember, epi-on is not an FDA approved technique. It can be done in a formal clinical trial or on an off-label basis after discussion of its risks and benefits. There are a number of clinical trials in the U.S. and internationally looking at other methods of epi-on crosslinking. These include new riboflavin formulations to improve uptake, methods which the ultraviolet power or adjust the ultraviolet dose, and ways to facilitate oxygen diffusion, such as intermittently pulsing the ultraviolet light or using supplemental oxygen around the eye during the procedure. We certainly look forward to results of these number of clinical trials and the evolution of crosslinking as time goes on. Certainly, this will remain a question until further clinical trial results become available. 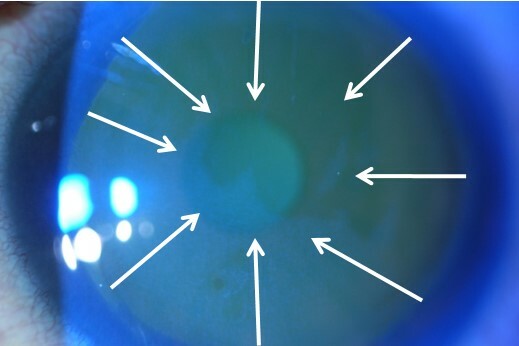 Purpose: To evaluate outcomes of corneal crosslinking (CXL) using a transepithelial technique for the treatment of keratoconus. Setting: Cornea and refractive surgery subspecialty practice. Design: CLEI Center for Keratoconus. Methods: Transepithelial CXL was performed in keratoconic eyes using riboflavin 0.1% and topical anesthetic containing benzalkonium chloride to facilitate riboflavin diffusion through the epithelium. Eyes were randomized to receive riboflavin administration either every 1 minute or every 2 minutes during ultraviolet-A exposure at 3mW/cm2. The principal outcome was change in maximum keratometry (K) and secondary outcomes included uncorrected (UDVA) and corrected (CDVA) distance visual acuities, mean K, and comparison of randomized groups. corneal erosion and epitheliopathy were reported in 21% of eyes. Conclusions: Transepithelial CXL resulted in significant improvements in maximum K and UDVA over 1 year. There was a suggestion that increased riboflavin dosing might improve procedure outcomes. Further study is required to determine the relative advantages and disadvantages of different transepithelialapproaches to the standard CXL protocol with epithelial removal. This single center, randomized controlled clinical trial is one of the largest to date designed to analyze safety and efficacy outcomes of transepithelial collagen crosslinking. In addition, 2 dosing regimens (every 1-minute or 2-minute riboflavin administration during UVA treatment) were compared to determine any advantages or disadvantages to procedure outcomes. Though of potential clinical advantage, there are several theoretical and practical hurdles to transepithelial crosslinking being as effective in mitigating keratoconic progression as standard CXL. First, the epithelium itself is a barrier to diffusion of riboflavin, a large molecule, into the corneal stroma. There are evolving methods, however, to enhance diffusion, such as those we have used in this study. These include eliminating dextran from the riboflavin carrier, treating with adjunctive benzalkonium chloride containing solutions or other permeability enhancers, and improving contact of the riboflavin with the cornea by means of a soaked pledget. Notwithstanding adequate stromal absorption of riboflavin, other factors may mitigate the crosslinking effect in the setting of an intact epithelium. First, both the surface riboflavin film30 and the riboflavin-soaked epithelial layer may absorb incident UVA light, attenuating the UV power/stromal depth relationship. Consequently, this may decrease the depth at which the threshold power for a crosslinking effect is met and the actual crosslinking would be less deep and robust than with the epithelium absent. Supporting this thesis is evidence that cytotoxic keratocyte damage is restricted to a more anterior, approximately 200 um, stromal depth in the transepithelial crosslinking approach.13,14 To diminish attenuation of UV power by surface riboflavin and riboflavin-soaked epithelium, it has been suggested that the riboflavin within the epithelial layer be removed before UV exposure by rinsing the corneal surface, and then suspending further riboflavin administration during the UV administration.31 Although this was not specifically studied in our investigation, the potential advantage of this technique is belied by our findings of more robust improvements in maximum K and uncorrected visual acuity in the every 1 minute compared to 2-minute riboflavin administration randomized subgroup; that is, there was a trend to better outcomes with greater, not lesser, administration of riboflavin during UV exposure. Finally, as noted in our previous work on standard crosslinking, the role of wound healing in the ultimate clinical effect of the procedure is unclear2. After the standard CXL procedure, there is a typical corneal stromal haze and demarcation line that follows a generally consistent time course; haze appears and is maximum at 1 month through 3 months and diminishes to baseline over the course of a year16. Indeed, haze appears to be a normal concomitant of the standard crosslinking procedure, and is first observed as dust-like change in the anterior corneal stroma which evolves into a mid-stromal demarcation line.34 Crosslinking associated corneal haze is most likely a measure of back-scattered and reflected light, causing decreased corneal transparency, and likely demarcates the depth of the actual crosslinking effect.35 This may be an effect of biologic changes such as keratocyte apoptosis, keratocyte repopulation, and changes within the collagen fibrils and surrounding glycosaminoglycans. Such haze is not seen, generally, in the transepithelial procedure, a finding touted as an advantage of the latter. However, whether stromal haze is, indeed, an unwanted side effect of CXL or, rather, is a proxy for beneficial stromal healing which may enhance a clinically effective crosslinking effect is unclear. Published results of transepithelial CXL efficacy have shown both positive and negative results of the procedure. They are difficult to compare since they are not uniform in design; different riboflavin formulations and adjunctive agents have been reported, different dosing regimens have been used, and varied techniques have been promulgated. For instance, Caporossi and associates26, using riboflavin/dextan with EDTA and trometamol as permeability enhancers, reported initial improvement in vision after transepithelial CXL, but a subsequent worsening of the maximum K value at 24 months. Gatzioufas and colleagues36 used riboflavin in a 0.01% BAC-containing solution and a 10 minute exposure to 9 mW/cm2, and reported progression in 46% of eyes. Koppen and associates37, using riboflavin containing dextran and BAC, found improvement in CDVA, but worsening of the maximum K. Demonstrating more positive results, Filippello and coworkers27 found general topography improvement after tranepithelial crosslinking using riboflavin/dextran, EDTA and trometol. In another study, Stojanovic’s group21 reported improvement in the UDVA, CDVA, and maximum K value after transepithelial crosslinking aided by superficial mechanical disruption of the epitheliuim. In a pediatric population, Salman38 found improvement in UDVA and maximum K value; they used riboflavin/dextran with EDTA, BAC, and trometol. Leccisotti and Islam39, using riboflavin/dextran and gentamicin, BAC, and EDTA, reported an improvement in the CDVA and mean K value. Rechichi and colleagues.40 used a corneal disruptor device to create and found a statistically significant improvement in UDVA and CDVA, and improvement in the mean simulated K value and steepest simulated K value over 12 months. In our study, we used riboflavin 0.1% solution without dextran and adjunctive administration of proparacaine with BAC to increase the permeability of the epithelium. In addition, we found that the application of an 8 mm pledget soaked in riboflavin for 15 minutes improved riboflavin uptake, likely a result both of enhanced contact as well as mild trauma to the epithelium. Although most eyes achieved saturation in one hour, some required up to 80 minutes for complete saturation. We used the maximum K value on corneal topography as our primary efficacy outcome. Maximum K was chosen since it measures a salient feature of keratoconus; ie the steepness of keratoconic topographic distortion. Moreover, topographic maximum K affords an objective, quantitative endpoint. Overall, maximum K decreased by an average of 0.45 D over 1 year, a clinically modest, but statistically significant finding. Looking at individual eyes, most eyes remained stable whereas 13% improved by 2 or more diopters and 5% increased by 2 or more diopters; 15% increased by 1 or more diopters. Although, these latter eyes might be considered treatment failures because cone progression was not stabilized, it is unclear what the natural evolution of the disease might have otherwise revealed; it is possible that disease progression was slowed but not completely, or that progression, indeed, proceeded apace. In addition to the primary efficacy measurement of maximum K, changes in CDVA may point to additional efficacy or, conversely, to safety concerns after crosslinking. In this study, there was no change in average CDVA over one year. Given the general improvement in maximum K and improvement in UDVA, we might have expected improvement in CDVA as well. However, the topography improvement, though significant, was modest and, thus, may not have manifest a clinically significant effect on corrected vision. Among patients receiving CXL, 24% gained 2 or more lines of CDVA, whereas 13% lost 2 lines or more. Curiously, of the 11 eyes with CDVA loss, maximum K was stable in 7, improved by 2D or more in 2 eyes and steepened by 2 diopters or more in 2 eyes. Thus, there was no obvious association of loss in CDVA with continued topographic progression. If we use the combined outcomes of continued worsening of maximum K associated with loss of CDVA, 2 eyes (2.4%) in the study can be considered to have suffered advancing disease even after the CXL procedure. Retreatment was suggested for these two patients, but they deferred and were lost to subsequent followup. 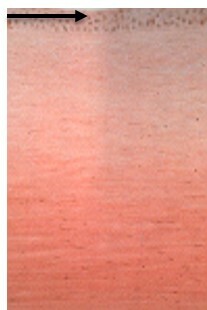 Of clinical note, this technique was typically associated with substantial punctate keratopathy of the epithelium after the procedure, and with frank epithelial erosion in 10 eyes. Because the native corneal epithelium acts as a barrier to diffusion of a large molecule such as riboflavin, the essential challenge of transepithelial crosslinking is to chemically or mechanically effect a microtrauma to the epithelium to enhance its permeability. Thus, it is likely that the lengthy time of riboflavin administration, chemical manipulation with BAC, and the minor trauma secondary to pledget application leads to transient epitheliopathy or even frank epithelial erosion in a number of cases. Although patient subjective pain was not prospectively assessed, 29 patients (35%) reported discomfort at the one day postoperative visit; the therapeutic contact lens was retained in these patients. Thus, a number of patients in this study were continued with a therapeutic lens for a total time similar to that of standard CXL with epithelial removal. One of the major debates in keratoconus management is the relative efficacy of transepithelial crosslinking to the standard procedure. Therefore, although not directly comparable because of study design and entry criteria, it is of interest to compare our transepithelial CXL results with our clinical results of standard CXL with removal of the epithelium. In our previous study of CXL outcomes,2 maximum K flattened by 2.0 D after one year compared to 0.45 D in the current study, suggesting that the standard procedure is more efficacious. However, the study cohorts for these two studies have important differences. First, the previous study was restricted to patients with documented progression of keratoconus over the prior 2 years compared to the current study in which all keratoconus patients could be entered. Second, the average maximum K value of the entry population in the current trial was 57.0 D, compared with 60.4 diopters in the previous study, a difference which may impact expected outcomes. In previous work41, we have shown that preoperative maximum K is independently associated with greater 1 year postoperative improvement in maximum K; that is, eyes with worse KC tend to have a more robust topographic flattening response to CXL. These population discrepancies, therefore, may account for some of the outcomes differences between the two studies. However, maximum keratometry did worsen by 2 or more diopters in only 1 of 49 eyes (2%) in the previous study compared to 4 of 82 eyes (5%) in the current transepithelial study, and it improved by 2 or more diopters in 17 of 49 eyes (35%) in the previous study compared to 11 of 82 eyes (13%) reported herein, suggesting that there is, indeed, less efficacy of this transepithelial approach compared to standard CXL. Similarly, there was no significant change in mean keratometry in our study population, compared with a decrease of approximately 1 D found in our previous trial of standard crosslinking.2 This, similarly, may be attributable to a somewhat less robust effect from a transepithelial procedure. Also, the mean K, which is measured from the central cornea, is generally a flatter area since maximum K is typically eccentric in keratoconus42 - reiterating our previous findings41, flatter corneas tend to have less of a flattening effect from CXL, so this could also contribute to the finding of no change in mean K in our study. Clinical trials have directly compared transepithelial to standard CXL, typically finding more robust results in standard treatment groups. Soeters et al performed a randomized trial in 61 patients comparing a standard to a transepithelial protocol.43 They found one year topography stability in the transepithelial group compared to significant flattening of 1.2 to 1.5 D in the standard group, but also noted that 23% in the transepithelial group showed progression of maximum K after one year, compared to no longer term progression in the standard group. In a randomized study comparing standard CXL with iontophoresis-assisted crosslinking, Bikbova and Bikbov found better stabilization and regression of keratometry values in the standard group.44 Of note, the average depth of the demarcation line was 292 um in the standard group compared to only 172 microns in the transepithelial group. Rush and Rush45, in a randomized trial of standard versus transepithelial crosslinking using an enhanced riboflavin solution found improvement of 1.52 diopters in the steep keratometry reading in the standard group, compared to only 0.54 diopters in the transepithelial group. Cerman and colleagues46, similarly, found more improvement in maximum, flat, and steep keratometry with standard as compared to transepithelial treatments. As seen in our study of transepithelial crosslinking, the standard post-CXL timecourse showing worsening of outcomes at one month is not seen. This is a clinically advantageous finding. Likely, it is related to the retention of the epithelial layer, with a much diminished epithelial healing response; it may also reflect altered stromal responses since epithelial removal may also militate stromal healing reactions. So, while one of the purported advantages of transepithelial crosslinking is the general lack of a stromal haze response, it remains unclear if the biologic and wound healing reactions signaled by the formation of stromal haze are actually unwanted or are, indeed, beneficial to the clinical topographic and disease stabilization effect of the crosslinking procedure. When directly comparing the 2 treatments, statistical analysis showed no significant differences in the changes in maximum or mean K values, CDVA, or UDVA between eyes randomized to riboflavin administration either every 1 or 2 minutes. However, in within-groups analyses, only the 1-minute cohort showed statistically significant improvement in maximum K. The one minute group improved by -0.73 diopter, compared to the two minute cohort which improved by only -0.14D. Regarding this finding, it should be noted that there was a significant difference in preoperative mean maximum K between groups; the one minute group, preoperatively, was significantly less steep (55.2 D) than the two minute group (59.2 D). Again, in previous work we have shown that steeper corneas tend to flatten more robustly with crosslinking.41 Thus, based on this, the two minute subgroup would have been expected to have a more substantial topography change, simply based on the steeper preoperative maximum K. That this was not found in the results supports our finding that the more frequent dosing regimen, indeed, leads to more robust results. While this certainly is not a dispositive finding with regard to riboflavin dosing in the transepithelial technique, it does belie the suggestion that rinsing the surface of riboflavin and adding no more riboflavin during the UV phase will improve outcomes by diminishing epithelial screening of the incoming UV power.31 Further investigation on this front is warranted before any clinical conclusions can be drawn. A limitation of this study is the lack of a control group, or treatment group with epithelial removal. Further controlled clinical trials evaluating different transepithelial protocols are essential to optimize the procedure. Variables such as riboflavin formulation, dosing regimen (including the option of adding no additional riboflavin during UV administration), UV power and time of administration, and oxygen availability may impact the outcomes of the transepithelial procedure. Moreover, when interpreting our results, it is important to note that inclusion criteria for this study admitted all keratoconic patients; although patients were chosen in whom crosslinking was felt to be indicated (that is, those patients with documented progression or at risk of progression), actual documentation of progression was not within the inclusion criteria. Because we had found, in our previous work, that patients with steeper corneas have a greater likelihood of topography improvement, study criteria did not exclude patients without documented progression in whom the likelihood of clinically significant topography improvement suggested a treatment benefit. Also, given the longterm nature of keratoconus progression, followup studies of greater than one year are essential in assessing the ultimate efficacy of this procedure, particularly since some studies of transepithelial crosslinking have demonstrated loss of effect over time.43 And, importantly, further controlled trials comparing the transepithelial to the standard approach with epithelial removal are necessary to determine the relative risks and benefits of each.